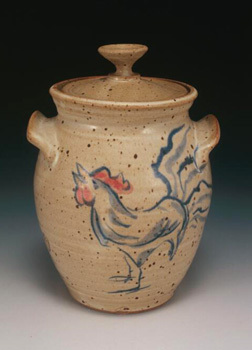 Our stoneware pottery is hand made, wheel thrown or thrown-and-altered. 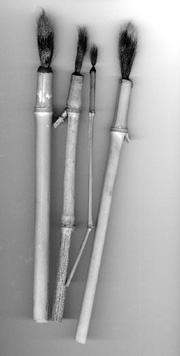 No molds are used; each piece is unique. Pots are bisque fired to 1830° F., then dipped in a lead-free glaze, decorated, and fired again in reduction in a gas kiln to 2380° F.
In addition to being lead-free, our pottery is oven, dishwasher and micro-wave safe. All the decoration you find on my work is original artwork, no decals or stencils are involved. I hand-paint my pots using traditional ceramic colorants: cobalt, iron, chrome and rutile, as well as commercial red and black stains. I use some commercial sumi-e brushes for color and shading, but most of the drawing is done with brushes that I make myself. I still have some of my first brushes, from college 25 years ago, crude things made from squirrel tail, wax, string and sticks. Now I use bamboo handles and thread and epoxy bindings. I still collect road-killed squirrels, though; I like the springiness and flexibility they bring to the brush. I primarily paint animal images, probably due to my childhood on a Wisconsin farm. Many are painted from memory, although I keep a portfolio of reference photographs, on paper or on my tablet, for some of the newer or more elaborate images. I also keep sketchbooks handy at the zoo, aquarium or county fair. I admire Chinese brush paintings. I don't consciously try to imitate them, but I think the simplicity and facility with brush leads to a similar look and style. 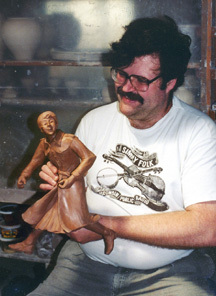 In the rare moments when I'm not busy with pottery, I hand-build figurative ceramic sculpture. These ceramic "people," often inspired by characters from history, fiction or music (I read widely in fantasy and scifi, and had a folk music radio show called The Saturday Café for 25 years on KLCC-Eugene) generally only appear at Clay Fest, as I've not had gallery representation since the Alder Gallery closed. My 2017 Ceramic Showcase entry, Baba Yaga Takes and Apprentice, was voted Best of Show, and my 2017 Clay Fest piece, Clever Girl took Second Place, joining a long line of Clay Fest award-winners, including Five Ducks (Best of Show, 2007), and The Bookseller's Apprentice and The Amazing Maurice and his Educated Rodents, (Second Place in 2007 and 2004, respectively). I've twice been accepted to (and once asked to be juror for) Eugene's highly competitive Mayor's Art Show, and one piece, "The Girl With The Flyaway Hair," was featured on the Mayor's Show poster for 2002. I have an on-again/off-again relationship with tile. For a time, I tried painting stand-alone images on hand-rolled tiles with impressed and rough-torn edges as frames. More recently, I've made mirrors in tiled surround, with painted animal images continuing around the entire frame. I've taken several commissions for back-splash tile with continuous scenes, and others featuring individual images to be incorporated into a commercial tile setting. Several of these series can be seen at my Flickr page.